KNRUHS PG Medical Admissions Counselling, Certificates Verification Dates, List of Documents 2019: KNR UHS has informed that the web based counseling will be conducted for admissions into Post Graduate Medical Degree / Diploma Courses for competent authority quota in colleges affiliated to KNR UHS and PG Medical Courses in NIZAMS INSTITUTE OF MEDICAL SCIENCES, HYDERABAD for the academic year 2019-2020. 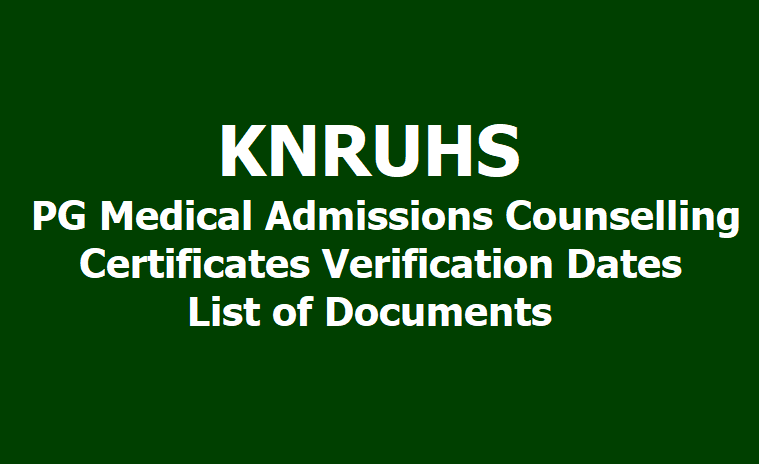 Candidates who have applied online in response to this office notification dated 22-03-2019 and whose names figure in the Provisional Merit list of PG Medical admissions to be displayed on 29-03-2019 in the Website of KNR UHS are informed to attend for FIRST AND FINAL verification of their original certificates as per the schedule given in the notification. Candidates have to attend in person along with print-out of their application form duly signed and two sets of self attested xerox copies. After verification of original certificates, the final merit Position of the candidates will be determined and notified so that the candidates in the final Merit list can exercise web options for Post-Graduate Medical Degree / Diploma Courses as the case may be as per the schedule to be notified separately. Processing Fee: Candidates have to pay non-refundable processing fee of Rs.2500/- for OC/BC Candidates and Rs.2000/- for SC/ST Candidates at the Bank counter at Helpline Centres at the time of verification of original certificates. NOTE : Candidates who have been allotted seats in All India Quota Counseling can attend for verification of Original Certificates on 30-03-2019 / 31-03-2019 in person with All India Quota allotment letter, Original Certificates along with 2- sets of self attested copies. Custodian certificates will not be permitted under any circumstances. Original certificates to be produced by the candidate at the helpline Centers for pg medical courses. Candidates attending for verification of certificates should produce the following Original Certificates for verification at the help-line centers. f. Certificate of Internship Completion. g. All marks memos from 1st MBBS to final MBBS. i. Study Certificates from 1st MBBS to final MBBS. k. Candidates who studied MBBS in Christian Medical College(CMC), Dichpalli, shallsubmit study / Bonafide certificates from 6th class to Intermediate / 12th standard and study certificates from 1st MBBS to final MBBS. l. Latest Permanent Category / Caste certificate in case of BC/SC/ST candidates issued by competent authority of Government of Telangana , Minority Certificate issued by Competent authority of Government of Telangana. m. Latest Service Certificate in respect of candidates claiming weightage of marks under Service category if applicable issued by the concerned Directorate. p. Photo identity proof viz .PAN card / Passport / Driving License / Voter’s ID. I. Only candidates shall appear for the verification of Original Certificates in person as per schedule notified. II. Candidates will not be allowed for verification without producing original certificates. III. Custodian certificates will not be allowed under any circumstances..
IV. Candidates who are eligible to be considered under SC/ST/BC/Minority seats also should produce relevant Caste Certificates issued by the competent authority of Government of Telangana, should attend for verification of their certificates at JNTUH, Kukatpally Hyderabad. V. All the Candidates attending for verification of Original Certificates shall bring two (2) sets of self attested Xerox copies of all the certificates. VI. Candidates please note that this is the first and final phase of verification of original certificates. No further phase of verification of certificates will be done, even if more number of seats in different categories in different colleges are included in subsequent phases of counseling. Candidates whose original certificates have been verified, can only exercise their web options in the subsequent phases for allotment. Hence, all the candidates who have applied online should get their original certificates verified without fail, as per the schedule given above. VII. Mere attending to the verification of certificates does not confer any right for a seat as more number of candidates exercise web options than the number of available seats. VIII. The procedure for preparation of seat matrix and selection into PG broad specialty in the competent authority quota and seat allocation will be done as per the procedure given in G.O.Ms.No.27 HM&FW (C1) Dept. Dated:10-04-2017 , subsequent amendments, and relevant Hon'ble Supreme Court and Hon'ble High Court orders.